It's time to have fun with this little DIY project that I've pulled together for you. All you need is a book, adhesive, scissors and plenty of clippings! If you're getting ready to renovate a space, compiling a book like this (also known as a 'look book') before you throw yourself into a design project will help you pull the process together. It's also fun to simply create these books to inspire you and pull you out of that occasional design rut. Step One: Locate an artist's notebook - something spiral bound and thick with pages measuring at least 8.5" x 11" (bienfang is good). You can use one book per room (i.e. living room inspiration), or you can divide one book into sections for each room in your house. My books have everything thrown together, however I'm soon to begin working on new ones that will be organized according to room. must. get. organized. Step Two: Purchase a good pair of scissors. I use a standard pair of Fiskars with the typical orange handle. I like the ones with the micro tip for trimming those pesky edges. Pay attention to how you clip - pretend you are laying out a magazine page. Make it look pretty, not clunky. Make sure what you're pasting fits the pages, you don't want to close your book and see clippings sticking out everywhere. No, no! Step Four: Cut and paste, baby! Scour magazines, catalogs, books, or even online (blogs!) to find things that you know you'll want to refer back to again and again. If you find something in a blog, simply print it out in color, trim, and paste it into your book. You can add articles that you enjoyed, quotes, ads, fabric swatches, paint chips, pretty business cards, font styles you like, stamps - get creative and have fun with it. No one is going to grade or judge your book, this is your personal space. You can even doodle on your pages and add handwritten comments describing why you like something you've pasted - these all lend a personal touch. When it's time to renovate, you can refer to your books as your guide since they'll assist you throughout the decision making process. Something so visual will most definitely pick you up when you're feeling stuck in a design rut - you'll have your trusty look book to turn to, it will get you back on track! 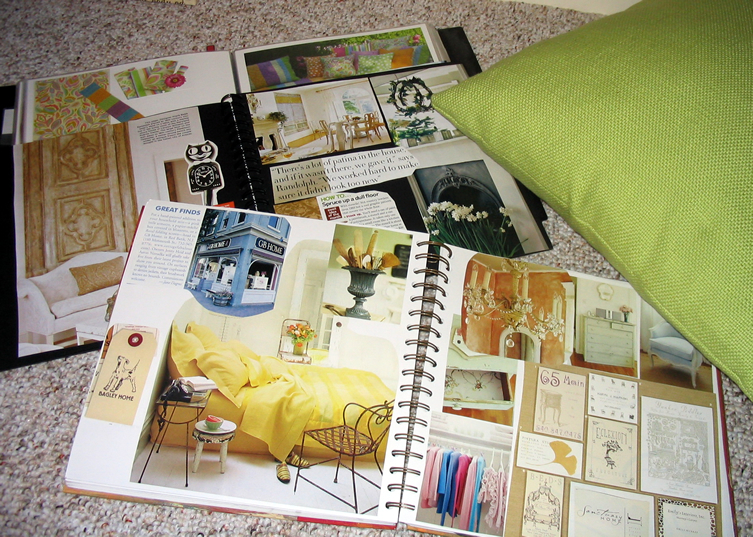 Before I consult with clients, I always ask them to pull together a folder of clippings that define their design style. I'm often so surprised when I meet with them and they pull out spiral bound notebooks stuffed with articles and clippings that they've collected for me. They always remark how grateful they are that I gave them homework because it helped them to pinpoint their design style. It also helps them to better communicate their vision with me because it's easier to express personal style on paper than through words. At least for most of us. I hope you have fun with your look book, and if you you'd like to send me a photo of yours, I'd be happy to post your book so we can all have a look.